In eWay-CRM the User can define several personal data views in the list for each module. That user view will be saved and displayed solely to the user who created it. If you want to share your view, please go to Shared Views. Each view contains information about the displayed columns and their order, filter conditions, items group settings and about the items sorting. Saved views are stored in the database, so they will not disappear after a system re-installation. To work with user views, you need to use the icon which is situated in the right part of the navigation panel. 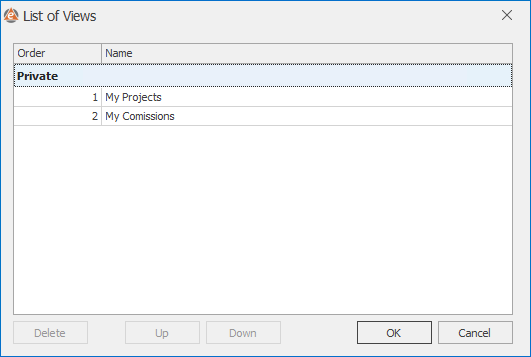 After clicking this icon a list of saved views will be displayed, also the option to save the current view (Save View), the option to open a list of views in a separate window (Show List of Saved Views) and the option to load the default view of the current module (Default). Note: We also prepared some default user views that you can use (these default views can be found in Deals, Projects, Companies, Contacts, Tasks, Journals, Documents, Emails and Time Sheets lists). Clicking Save View will bring up a window for entering the name of the new view. If a view is displayed, the name will be pre-filled with the current view name. 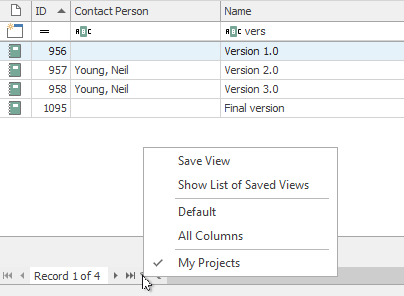 Clicking OK will save the current view (displayed columns, filter, sorting and so on) under the entered name, clicking Storno will close the Save view window. Clicking Show List of Saved Views will display a single window, in which you can edit existing views. Select view, which you want to edit. With the Up and Down button you can change its rank in the list, clicking Delete will erase the selected view. Clicking the Name column allows you to change the view name. Clicking OK will save any changes, clicking Cancel will close the settings window without saving any changes. Availability: Shared user views are available since eWay-CRM 5.2.0. User view can be saved for all users in your system, for example when one view is important for all your employees. Shared user view can be created only by administrator. When administrator saves user view, there is possibility to mark Share With All Users check box. If the administrator marks the check box and save the view, this view will be available for all other users. For the better orientation, this shared view will have (Public) suffix next to its name. In the list of views, there are two categories - Private and Public. 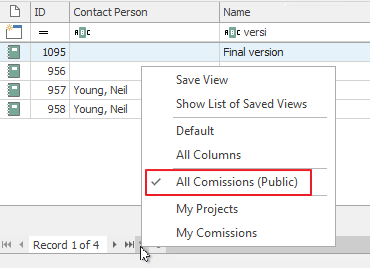 Administrator can delete or order views in both categories, other users can remove or change order only of their private views.